The TPMS improves driving safety by notifying the driver of changes in tire pressure and temperature. Failures of under-inflated tires at highway speeds are dangerous and can lead to major accidents. Most failures can be prevented if tire pressure changes are detected early. 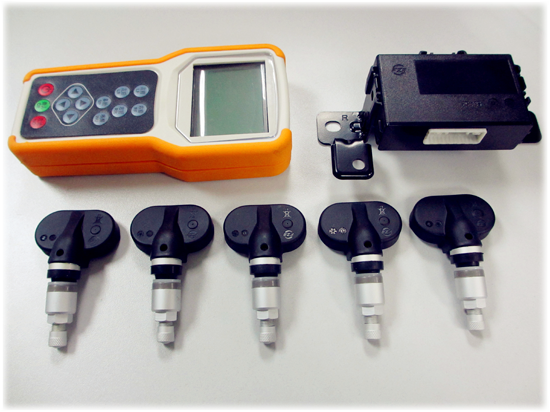 Monitor the pressure and temperature in real time. Warn of high pressure, low pressure, high temperature and leaking. When the battery in sensor is used up, it will remind the driver to install a new one. The frequency of RF transmission will adjust according to the acceleration to preserve battery life. Warning threshold can be modified through the OBD to suit different kinds of tires and vehicles.